I've followed guitarist Mika Gronholm's career, from his first album, with some interest. He's essentially a self-taught player, having little to some instruction in the past. He's used his time and experience to develop both talented guitar skills and songwriting, with more than a little experimentation thrown in. He arrives with his third album Relativity Code For Love with songs about love and relationships. Also, Gronholm has a new voice in Shy vocalist Lee Small. This album is largely a return to the beginning, a melodic hard rock album with some AOR and prog influences. Of course, Gronholm's guitar skills and song arrangements take the primary focus. Initially, I wasn't all that impressed. The album starts rather lackluster with Reasons, a heavier, not so catchy, melodic rock number with Small trying to overcome the music. If this was an prediction of what was to come, Small would be pummeled throughout this album. And, for the most part, he is. It's almost as if the music is not suited for him or he had no participation in it's development. However, in the lighter moments of a song, like Home In Our Hearts, he's heard somewhat better. In a fuller measure, his voice is heard better in Strangers and Once. Conversely, the rush and riffage of Mystery buries him. Yet, Mystery is indicative of some of Gronholm's best song writing. Heavier, lots of groove, big riffage and guitar fireworks, with Tom Rask's drums driving things along. Call it AOR metalized melodic rock. Another good one is Gravity which is moved almost entirely Gronholm's guitar line and Rask's drum line. And Rask is formidable drummer. Note the start of Like An Angel, another more metalish tune, where his drums rise to introduce the song and then simply power their way through the entire song. It's a perfect mixture of power and groove. Adding Gronholm's melodic guitar harmony, blistering riffage, and the arrangements inherent speed, the song is a monster. Indeed, there's much to like about this album, notably the guitar work and song composition from Mika Gronholm. As for Small's vocals, it's probably best to follow his melody as it compliments everything else. Otherwise, Relativity Code For Love finds Mika Gronholm and company in fine form once more. 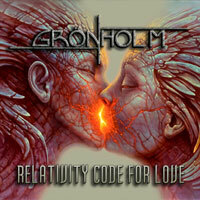 Offering a melodic hard rock album with some AOR, heavy metal, and prog influences, Relativity Code For Love finds Mika Gronholm and company in fine form once more.